Susun Terese and Andy Shattuck are the only Maine group to perform in the Battle of the Ukulele Bands April 20 in Portsmouth, New Hampshire. 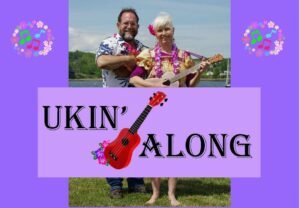 FARMINGTON — Susun Terese and Andy Shattuck formed the ukulele duo Ukin’ Along in 2016. On April 20 they will be competing at the first ever Battle of the Ukulele Bands in Porsmouth, New Hampshire. The program starts at 2 p.m. and will be held in the Portsmouth Music Hall, 28 Chestnut Street, which seats 898. Tickets are $45. In 2003 the Portsmouth Music Hall was named an American Treasure by the Department of the Interior. Southern New Hampshire Ukulele Group (SNHUG) is organizing the event which will be a fundraiser for Ukulele Kids Club. The UKC is a nonprofit group dedicated to bringing instruments and music therapy to hospitalized children. Terese said UKC has given more than 7,000 ukuleles to kids. Shattuck first heard of the competition before Christmas. He shared the information with Mike Burd, director of The Merry Plinksters to see if that band would be interested in participating. Shattuck and Terese are both members of that band too. Shattuck said he spoke with Terese about it and they decided to participate since The Merry Plinksters wouldn’t be. Ten bands will be competing in the battle of the bands. Most are from Southern New Hampshire with one from the Rhode Island area. “We’re the only Maine group participating. It was kind of surprising to me, given the number of ukulele bands there are,” Shattuck said. “We’re excited, flummoxed. I ask myself, ‘Oh my gosh! We’re going to do this?” Terese said. Terese said gold-, silver- and bronzed-colored ukuleles will be awarded to the top three bands. The bands will be judged on appearance, crowd response, musicianship and showmanship with 10 points available for each. “It would be fun if we won something,” Terese said. Each band has 10 minutes to perform. Points will be taken away if they go over their time limit. Terese said one band has 35 members and has raised over $10,000. “We’re fifth among the ten bands in fundraising,” Terese said. Terese and Shattuck have been practicing like crazy to memorize the verses and the chords. They will not be using sheet music, as they normally do, for this performance. Terese said they will open their performance with a Dave Mallet tune. Ukin’ Along will be their second song and they will finish with a waltz, Making Music With You. Terese wrote those songs. “I’m hoping Susun’s original songs will help us,” Shattuck said. He said they created a promotional video over the weekend that was harder than he thought it would be. They had a Skype meeting with the sound crew and other bands have provided floor plan setups. “It’s really big time. We’ll have our own dressing room. It’s kind of surprising,” Shattuck said. He said Terese plays the baritone ukulele which is bigger and sounds more like a guitar. Shattuck plays a regular ukulele and a bass one. “They give a good variety for us,” Shattuck said. For those who can’t attend the battle of the bands, Ukin’ Along will be performing at The Pancakery at Old South Congregational Church in Farmington on April 28. Shattuck is a long-time member of The Merry Plinksters. He studied Ukulele 101 with Burd and now fills in when Burd can’t be with the group. Terese joined the group six years ago. She played ukulele in the South Sea Islands as a teenager.